BitcoinPenguin Dice Games Review – Scam or not? We will be looking into Bitcoinpenguin.com today and experience what they have in store for our Dice players. Bitcoinpenguin is an online casino website that offers games that range from Poker, Slot Machines to Table games that you are able to enjoy any time of the day! They even have live games wherein you are able to jump right into. Though I find this untrue as I tried most of their “Live” games and only two were running at the same time. Below would be the Dice Games that are available at Bitcoinpenguin.com. Here are the Dice Games available to play with them. 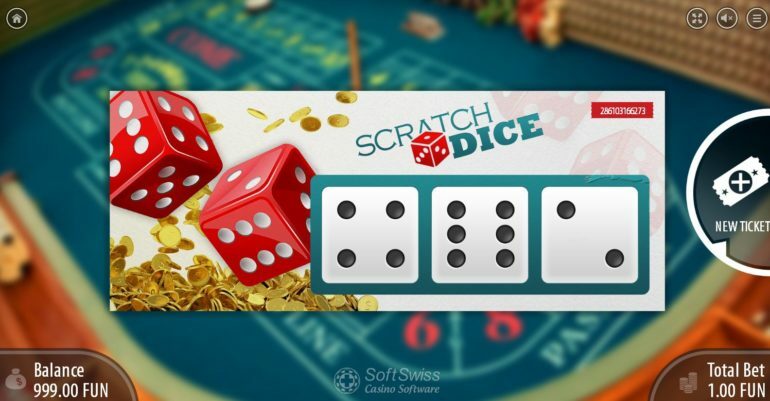 Above is a screenshot of the Scratch Dice game available to play at Bitcoinpenguin.com. As you can see you have a ticket serial number wherein you would get per ticket that you buy from them. These tickets are not in any succession but are arranged in random. This means that a ticket ending with 989 will have a ticket next that is 990, they are arranged in random. What does that mean? It means that you are able to skip the tickets with the serial numbers that you do not like. I know some people are “picky” when it comes to the cards that they purchase. I am also guilty of that pleasure when it comes to scratch dice. Pick which feels lucky and buy that ticket, there is no limit on how many times you click on SKIP so do not be shy in using this feature. Of course, to purchase a ticket you just need to click on “BUY” to purchase it. There are two variations to Sic Bo here at Bitcoinpenguin.com, one would be the single-player mode wherein you would just be redirected to a separate private room and you play with the computer. The second mode would be the Live Sic Bo games wherein you would be able to see a dealer that would be shaking the dices for you. Sic Bo is a game of pure chance this is why people would love to play this game. Watching it lives makes it even more intense as you wouldn’t have any idea on what would be the dice combination. A proper Sic Bo game involves sweaty hands and impulsive bets. Bitcoinpenguin.com is an online casino website that proves to be what they say they are. They do only have a couple of Dice Games to offer but this does not mean that they are not capable of delivering what you need. Though at first the thing that I noticed about this website that it is really hard to navigate on your first visit! The upper tabs are not visible in the first minutes of you looking into their website. It was not until I registered that I noticed the upper tabs wherein you would be able to directly browse the content you want to see. If you rely on the slideshow of games that you are greeted with when you visit their website then you would have a hard time getting around. A website that is not worth your visit as they do not have that much here compared to other ones that I have tried! They do have “Free Games” wherein you are able to play for free just to get a feel of things; always good in my book.